Do you struggle with high notes? Is your “Break” keeping you from singing how you’d like? Are you experiencing vocal fatigue? Are you frustrated with your current progress? Do you KNOW you can be a better singer but just can’t get there? I can help. 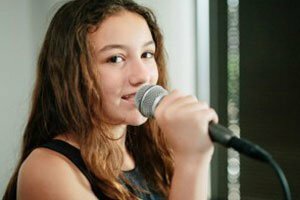 Why Confident Voice Studio For Voice Lessons? 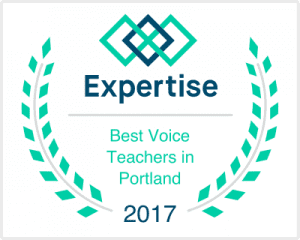 Customer Satisfaction: With many options for voice lessons in Portland, Confident Voice Studio is consistently voted #1 by our customers. Our teachers, location, involvement in the community, business philosophy and our focus on serving our customers are just a few of the things that we believe contribute to earning that place in our customers’ minds. Community: At Confident Voice Studio, you are not simply signing up for private voice lessons. Rather, you are joining a community that is all on the same mission together: to inspire a growing community of passionate and excellent musicians! We create this community atmosphere based on some core principals: • Everyone has value and should be accepted, included, encouraged and affirmed through their interactions at Confident Voice Studio. • We must challenge each other to continually grow, develop and improve through focus, hard work and practice, AND • We must be honest and kind to each other at all times. This idea of community is central to who we are as a company and how we interact with our customers. It is also key to helping us serve our students in a way that builds confidence, social skills, coordination, work ethic, personal responsibility and, of course, a love for and ability to play music. Facilities: Our studio is stocked with everything students need to create a great learning environment. From inspiring posters, to music stands, mirrors, whiteboards and a keyboard, we make sure to have a comfortable and safe space for lessons to take place. We maintain an open door policy with parents who want to sit in on a lesson from time to time. How Do Voice Lessons Work At Confident Voice Studio? Once scheduling is out of the way, it’s time to rock. You will meet with your teacher once a week at the same time each week for 30, 45, or 60 minutes, depending on which you select. Our favorite lesson length for most students is 45 minutes because it allows time for building a relationship, warming up, reviewing what was learned in the previous lesson and providing new instruction. Thirty minutes is great for younger students and an hour-long lesson is great for more advanced students who are interested in accelerating their progress. We offer several music lesson options. These various packages offer options to our customers to match their needs related to schedule flexibility, pricing and commitment. At Confident Voice Studio, students will learn to train their ear, expand their range and find their own unique tone. We offer training on how to properly use your voice to get the best sound and avoid injury. Every voice is different, so lessons are tailored to individual needs in order to develop the voice to its full potential. We understand that voice lessons can be scary, so we work to learn about who you are, what you want and how to best help you learn. You will spend your lesson time on a mixture of warmups, exercises and learning songs you enjoy to help build your repertoire. Many of our voice students use this time to prepare for upcoming auditions, performances, or simply to continue to develop their talent. How Do I Sign Up? If you would like more information about our voice lessons, CLICK HERE and tell us a bit about you. Someone from our team will contact you to find out more about your needs and match you with a time that works best for you. Come see why we have been voted one of the Top 19 voice teachers in Portland! Utilizing the Blaylock Vocal Method and other vocal training techniques will maximize your vocal abilities in any style of singing. From Opera to Rock; Jazz to Pop or R&B, speakers, teachers and actors have improved their vocal presence. Training with the Blaylock Vocal Method will both improve your voice allowing you to sing safely and with greater range, no “cracks,” “breaks,” or losing strength in the middle connection. It’s a way of using your voice that allows you to sing freely and clearly with maximum power and clarity. Since you are not learning what to sing but rather how to sing and maintain an even balance through your voice, you can apply this technique to any type of music. Get Help Now No Matter Where You Live! Call 503-714-1198 today or Click here to contact me and schedule a free consultation. My son tried many different classes and has had many different instructors. Deanna has by far been his favorite instructor and he is always excited and ready for class. The program she uses is wonderful, it introduces children to sequencing and patterns, fine motor skills and development and so much more. I highly highly recommend classes with Deanna. We love her! Before studying with Deanna… I was less confident overall in my singing, my voice cracked in a lot of places and my range was a bit narrower. The most difficult part about that was singing in front of others and not being quite sure what notes were going to come out of my mouth. The thing about Deanna is that she is very welcoming, supportive and makes you feel comfortable. My biggest insight learned during our lessons was that it is possible to get my voice to be more predictable, the importance of proper breathing and that it really is helpful to record and listen to your own voice. And this was valuable because it’s a confidence booster especially during performances. I gained confidence, comfort and knowledge about singing. I’d recommend Deanna to singers that want to stretch the current limits of their voice and feel more confident singing. Thanks so much for this great experience! Before I started working with Deanna I was light in presence. I didn’t have a booming voice, and though I may still not- I felt Deanna’s direction allowed me to push past the previous limitations that I set for myself. The most difficult part about that was I hadn’t much experience singing for long periods as I later would with Deanna. I was very rough with my approach to singing- never warming up, and not aware of the harm straining can do. If I had continued down the path I was on I probably would have damaged my voice. I had always heard of the precautions singers took, but I tended to dismiss them as obsessive or myth. The thing about Deanna is that her approach to instruction allows a newcomer to feel welcomed and at ease when learning new techniques and being exposed to a whole new array of material, such as music. I was very new to music theory- but quickly picked it up through her teaching, and never feared asking questions. I’d describe Deanna as considerate, patient, and observant. I have gained knowledge in reading music and having an even greater stage presence. I loved working with Deanna and the cast, and will always use the experience as a reference for future experiences. I’d recommend Deanna to other vocalists who want to use their voice as an ultimate instrument in their performances. Before I worked with Deanna my singing voice did not feel natural. She has helped me find my true voice. Deanna is that she is keenly focused on your particular needs as a singer, and is able to assist you in reaching your particular goals. Working with Deanna, I gained confidence, strength of voice, as well as greater range. My 4-year-old son has been taking lessons with Deanna for the past 6 months. I am a preschool teacher. I was immediately impressed by how Deanna was able to connect with my child and work with him with such calmness and ease. My son tried many different classes and has had many different instructors. Deanna has by far been his favorite instructor and he is always excited and ready for class. The program she uses is wonderful, it introduces children to sequencing and patterns, fine motor skills and development and so much more. I highly highly recommend classes with Deanna. We love her!